"Everything was amazing and we are so happy! Thank you and Craig for all you've done for us! Ricky and I were just talking about a trip to Mexico soon and will continue to use yall for all of our trips :)"
We arrived at the resort and were immediately ushered to the preferred check in. It took about 15 minutes to get everything situated and for the concierge to go through our packet with us. We booked a regular room and were upgraded to a suite and the preferred club without mentioning it. The only annoying part about check in is that we were handed off to another lady who insisted that we meet her the next morning for the "VIP breakfast" in the lobby at 9AM. I knew better and knew this was a 90 minute time share presentation so we did not go but I was a little annoyed that we were bombarded right off the bat when we had guests waiting on us at the resort already. Our room (6214) was ready and our luggage arrived very quickly. The room itself is nothing too fancy but we actually loved the space and everything was immaculately clean. The bed was incredibly comfortable and we had no problem falling asleep...just getting up in the morning after all the liquor! The only issue I had was finding an outlet. I think there ended up being two available in the room. One in the bathroom and another on one side of the bed. They look different than the typical American outlets but our chargers and cords plugged right in. I cannot say enough about the service our group of 35 received. Everyone seemed to truly be happy to be at work and we were never far from someone who wanted to refill our drinks or help us with anything at all. We spent a little time in the preferred lounge and loved it in there as well. We came to our room three times to find champagne waiting on us and were given two bottles of rum as well that we are bringing home. You will definitely want to bring some tip money. Not that anyone hangs around or acts as if they are expecting it, but they certainly deserve and appreciate it. The resort itself is kept up very well. What you see in the pictures is what you'll arrive to. We never found empty glasses, trash or anything on the ground. The beach is rocky, but clean and beautiful. There is definitely pride taken in how well they maintain the grounds and it shows! All we did for a week was eat and drink. Everything was great and my husband keeps raving about how fresh the fish was. Food will definitely not be an issue for any guests, there are so many options. My husband and I booked massages and they were heavenly!! The spa is beautiful and after all this planning, you should go. They offer discounts daily, we had a discount of 35% so for a 50 minute deep tissue and Swedish massage, our total with tip was $220. It was a hell of a deal. We spent every night in the casino and walked away with a bit of money. The casino is small but it turns out that we preferred it that way. We took a taxi to the Hard Rock Casino down the street and while it's beautiful, it was hard to keep up with each other and we ended up going back to Dreams. As we were leaving we all talked about how Dreams is the perfect place if you actually want to hang out with your guests. Maria was my wedding coordinator and while I was so frustrated with the email response time, I quickly forgot when I met her. She's very nice, helpful and was able to quickly answer any questions we had. She pulled off our wedding and reception without any issues at all and was fantastic. I know it's so hard to not get an immediate response but after watching her work, it's honestly because she is setting up 3 weddings a day and is out and about. The great thing though is when you arrive, it is all about your wedding and she is available at all times. We chose the symbolic paradise package and built up from there. Our wedding was Thursday at 5 on the beach and was absolutely gorgeous. They did waive the 3 day rule, where you have to arrive 3 full days before your wedding. My husband is in the military and was unable to change our arrival date so they worked with us. We bought and put together centerpieces but at the last second I decided I didn't want to travel with them or pay the $150 decoration fee so we only brought my bridesmaid bouquets and a cake topper and I couldn't have been happier with it. When I say I brought nothing, I mean it. None of my guests noticed that the tables didn't have something fancy on them and with the beautiful views, they certainly didn't care. I did see another wedding during the week with beautiful flower centerpieces and lights but for us, the environment was enough and I would do it again just the same. We made our own playlist on Spotify and rented the sound system for our reception at Himitsu and it was perfect. We had the silver dinner menu with Dominican appetizers, Caribbean soup, beef tenderloin and apple pie and it was all so delicious. It also came with the silver bar. I will say if you're on the fence about what cake to get....ALMOND. Just get the almond. Our guests are still talking about how it was the best cake they've ever had. If you have left overs, make sure to ask for to go plates to take it to your rooms! You'll want it later! We bought the resort's video and photo package of the wedding and are blown away at the quality of them. It was the best $1400 spent for those. The photographers were great and really captured the personalities of not just us but the group. If you have to cut things to get the video, I really suggest it. At the end of the day, we cared more about the video than something on a table. We wrote our own vows and I think I heard about half of my husband's through my tears and trying to hold my makeup in place so it's really great that we can go back and watch it together. It also showed us things we missed like the guests coming in, leaving and the tears during the ceremony. Overall, we loved our time at Dreams. I touched on it a bit above but the resort is big enough to have space and to walk off your meals (and drinks) but small enough that it's easy to coordinate and spend time with your guests. When we booked our trip, we looked for a resort that would meet the needs of 35 people who are coming from all parts of America and would allow us to spend time with them and we certainly found that in Dreams. We never had a problem with the wifi and I definitely recommend setting up a wedding group on Facebook for your guests so they can see who all is attending. I think it helped our guests who didn't know each other to recognize one another as well as let people know their room numbers and what people were doing for dinner, send pics, etc. There are so many resort options available to fit your unique style and needs. With such a variety of locations for your wedding, it can feel overwhelming to start researching all the different venues by yourself. 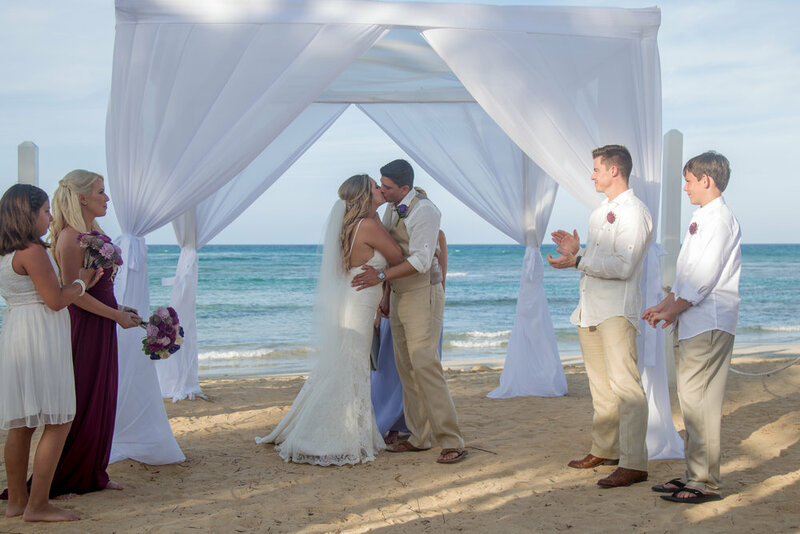 Contact a Coral Tide Destination Wedding Specialist to get a full list of options! We have visited so many resorts and wedding locations and we are here to help you to find your perfect fit! Contact info@coraltidetravel.com for details.